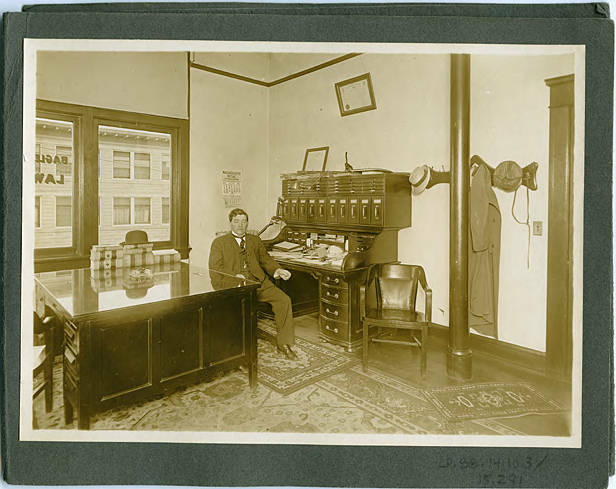 Black and white image of a man seated at a roll-top desk in an office. He wears a three piece suit, a tie, and a shirt with a stand-up collar, and his hair is combed to one side. A bowler hat sits on top of some stacked books on a desk behind him. The desk is covered with papers and heavy files sit on top of it. A candlestick phone is attached to a metal arm at the far side of desk, which appears to make it convenient for hands-free use. Oriental carpets of various sizes cover the floor, and hanging on hooks on the right of the desk are a straw hat, an overcoat, and a deerstalker hat with earflaps. A large diploma hangs on the wall above the desk, and another certificate sits on top of the back of the desk. According to the calendar on the wall behind him, it is June, 1913. On the window to the image left can be seen the letters 'Bagle' and 'Law,' indicating this is the Bagley and Hare law office in downtown Hillsboro, where it appears to have been on the second floor of a building. This image is part of a group contained in a tri-fold folder; see WCMpic_015279 and WCMpic_015281 for the other two images from that folder, and WCMpic_15282 for another image of the Bagley and Hare law office library.